Convert a Standard LP4 Power Supply Connector to an 8-pin PCI Express Video Card Power Connector. The LP4PCIEX8ADP 6-inch LP4 to 8-Pin PCI Express Power Adapter converts a standard LP4 power connector on your existing power supply to an 8-pin PCI Express video card power connector, allowing you to install a PCIe graphics card without having to upgrade the computer power supply. 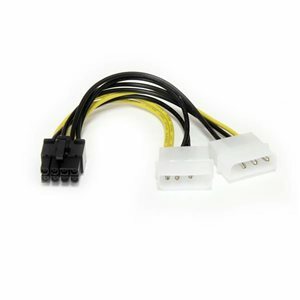 The LP4PCIEX8ADP 6-inch LP4 to 8-Pin PCI Express Power Adapter converts a standard LP4 power connector on your existing power supply to an 8-pin PCI Express video card power connector, allowing you to install a PCIe graphics card without having to upgrade the computer power supply.